Radicchio is a perennial leafy salad green, also known as Italian chicory, red chicory or red endive. It usually has variegated deep red - maroon or red and green leaves with contrasting white veins, however there are varieties which are either white or yellow. The best flavor and strongest color comes from growing radicchio in cool temperatures. Radicchio is grown very similar to that of lettuce, but looks more like a cabbage. Some varieties have a round head. Others grow more elongated in appearance. The heads can also vary from a tight forming head to the leaf type. It has strong tasting leaves that can be noticeably bitter when eaten raw, which is the most common way to use radicchio. The flavor mellows and loses some of its bitterness when cooked. Chicory is a perennial and when harvested by cutting the plant stem just above ground level the plant will regrow the following spring. 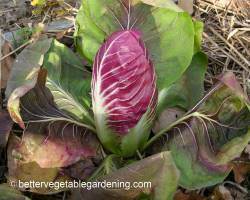 The quality of the re-grown plant however is never as good as radicchio that is grown as annuals. The head has been harvested. The regenerating head will need some sort of protection against severe frosts. 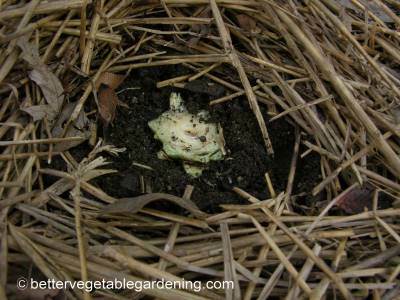 This can be in the form of upturned pot or container, or a heavy mulch, as shown in the photo. 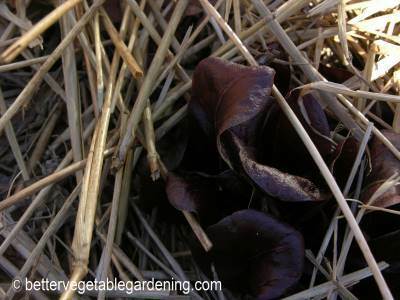 A few month later and a brand new head of radicchio is pushing its way through the straw mulch. Radicchio is a cool season vegetable that can be planted 2 - 4 weeks before the average date of the last 32 F (0 C) freeze in the spring in your area but not before soil temperatures are consistently 40 F (4 C) and above. It is frost tolerance but is injured by hard freezes so will need protection in early spring and fall in some areas. Best planted in sunny position, will welcomes shade in the hottest part of the season however hot weather tends to make it bitter. Growing radicchio requires a minimum of 3-4 hours of direct sunlight daily. Radicchio is pretty typical to most vegetables, liking a soil rich in humus that retains moisture, well drained with moderate fertility and pH between 6.5 to 6.8. Direct sow or Seedling transplants. 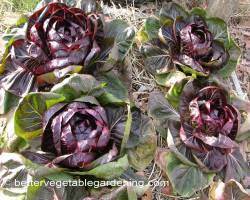 Radicchio can be planted in the spring and again in mid-summer for fall-winter harvest. When growing seedlings for transplanting ensure they are kept growing forward with no growth checks as radicchio seedling have a tendency to go to seed (bolt) prematurely. Direct sowing, thin to 8-12 inch (20-30 cm) spacing's. Transplant or thin radicchio seedlings to 8-12 inch (20-30 cm) apart in rows 12-18 inches (30-45 cm) apart. Radicchio is shallow rooted and needs consistent soil moisture. Soils with plenty of organic matter and a heavy mulch helps to retain moisture and limit weed growth. 2 weeks before sowing or transplanting apply 2-3 quarts per 100 sq feet (2.2-3.3 liters per 9.3 square meters) of All-Purpose 5-5-5 Organic Fertilizer. Side dress every 3-4 weeks with the same rate as initial application. 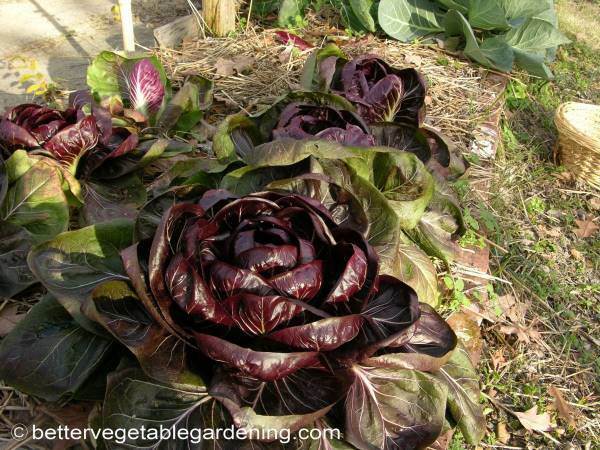 Include Radicchio in with other leaf vegetables in your crop rotation plan. Most gardeners find that radicchio grows with few problems. You can harvest individual leaves at any time once they are of usable size. To harvest, cut the entire plant just above the soil line. Harvest heads when they’re young, older heads become more bitter. 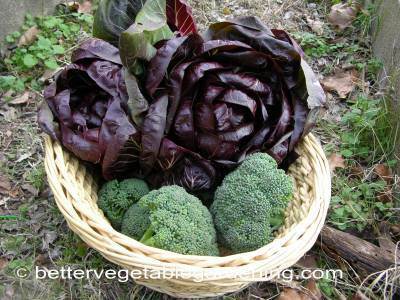 Harvest basket of Radicchio and Broccoli. Heads are ready when they’re firm to the touch, they look and feel similar to head lettuce. Radicchio grown in the fall last longer and is much better quality than crops grown in the spring. Radicchio will last when stored in the refrigerator in a perforated plastic bag for 3-4 weeks.